Must Cheese Be Served with Apple Pie? It certainly sounds plausible since after all this is the Dairy State, but the answer is no. Now I've never had my apple pie with cheese before, but I imagine I should test out this question for myself. Should cheese be served with apple pie? Perhaps! Banking Crimes: Fraud, Money Laundering and Embezzlement explores issues with the investigation, prosecution, and defense of crimes against federally insured financial institutions. Author and private attorney John K. Villa specializes in civil and criminal corporate and financial services related litigation in Washington D.C. Using his expertise from years of practice, Banking Crimes is an attempt to collect and extract the significance of all the Federal court opinions interpreting the many criminal statutes passed by Congress in recent years. This work is comprised solely of the author's interpretation; federal prosecutors, defenders, and bankers would all benefit from this comprehensive examination of white collar crimes. The text includes primary excerpts of US Code and the Code of Federal Regulations. Appendices include relevant supplementary materials such as excerpts from the United States Attorneys' Manual and Financial Institution Fraud Federal Prosecution Manual. 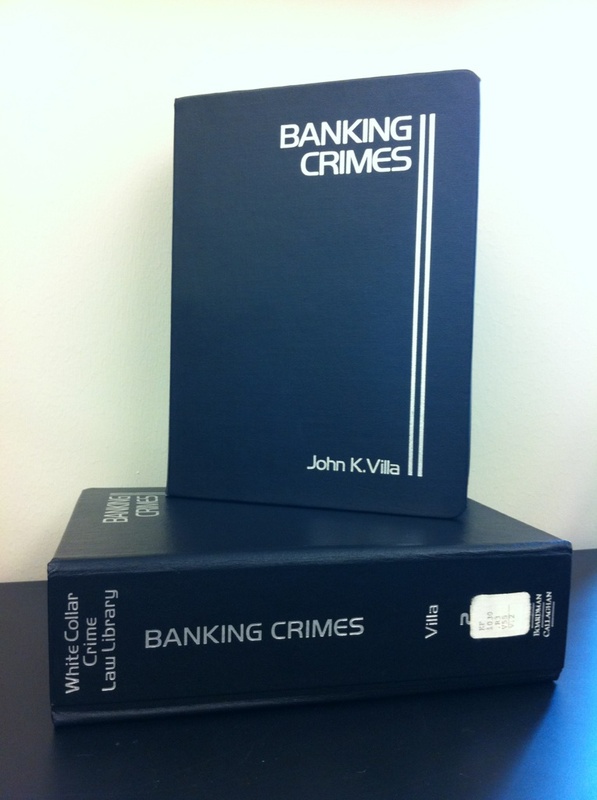 Banking Crimes is available for check out from the Wisconsin State Law Library. On March 16, 2012 the government website GPO Access, online since 1994, will shut down. Those accustomed to going to GPO Access to search for Federal government documents will be redirected to the new GPO Federal Digital System site, FDsys. FDsys, active since 2009, updates and replaces the old GPO Access website. Use FDsys for free online access to official publications from each branch of the Federal government. Search by title or by keyword, or browse by collection, Congressional committee, or date. Do you need help finding a document? Ask a librarian online or call us at (608) 267-9696. As always, your comments are welcome.Send comments to Connie Von Der Heide.